This issue opens up with Carl packing his things, getting ready to leave and go apprentice at the Hilltop. Meanwhile, in the basement, Rick has his own little talk with Negan. The prisoner reveals to Rick that he's been talking to Carl from time to time, and those talks have let him know Carl is leaving for the Hilltop. The conversation gets real tense when Rick confidently tells Negan he knows he'll die behind those bars. One bit of proof is the fact that Negan doesn't even curse as much anymore. Rick's convinced he's neutered him. He then leaves his prisoner to think about his future. All the preparations are just about done and both Rick and Carl are ready to hit the road to the Hilltop. Before leaving, Carl get's a visitor from a local girl named Anna. She gives him a note and asks him not to read it until he gets to the Hilltop. He agrees and the two men are on their way. The whole way there, Rick keeps bothering Carl to give him the details on his new "girlfriend". It was really nice seeing these two finally act like father and son again since this whole new world came to be. Things take a very dark turn very soon though. The two get ambushed by a very small group of walkers. Rick deals with most of them but when things get tough, Carl is forced to use his gun and attract a bit of attention. He attracts the guard who was supposed to be patrolling the area and Rick snaps on him. Personally, I felt like it may have been a little too much, but Rick makes some real good points. They don't live in a world where those small mistakes are acceptable. Literally one small mistake like skipping a section on patrol can lead to a break in and lost lives. The next page is very interesting. It shows two brothers making their way across a field, and one is very hurt. The hurt brother, Ken, falls off the horse and when his brother gets off to help him, the horse runs off. The two now have to walk away and try to keep well ahead of the walkers coming up behind him. Meanwhile back in Alexandria, Magna and her group, all skeptical of Rick and his group, have snuck around and found their way into the house that doubles as the prison. They make their way downstairs and find Negan, who puts on a new act after seeing these new faces. He asks them to help, and break him out because he's being kept there, trapped, by crazy animals. What are Magna and her group supposed to think now? Are they going to want to hear Rick out, or are they going to break out Negan, allowing him to escape and restart his rebellion? 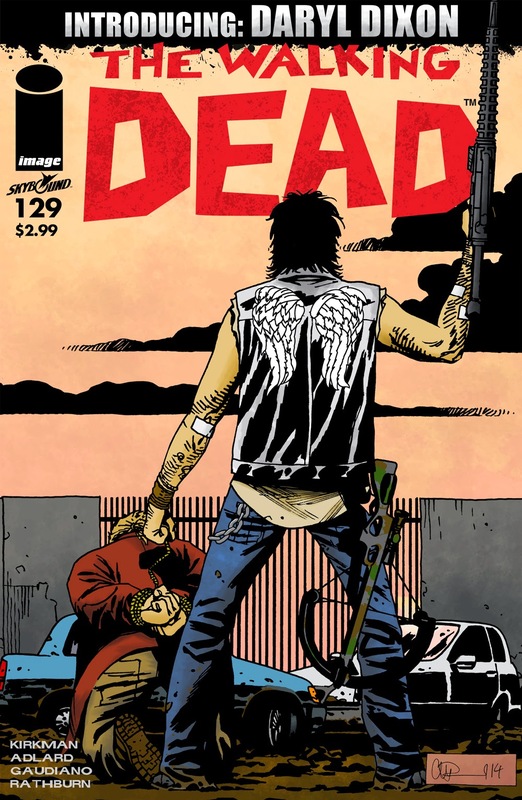 Guess we'll just have to find out in a couple weeks when the next issue of The Walking Dead hits stands.